When I say “aloe,” you think...? Aloe vera, right? Interestingly, most people don’t know that “vera” describes a botanical species. They think Aloe vera is some magic that comes out of a bottle (often dyed green) that might be distantly related to a plant. People don’t realize that other aloe species—such as ferox, arborescens, and saponaria—are also medicinal. But even more likely, they don’t know that most aloes are not medicinal at all. Aloes have other uses, too. Did you know you can make soap from Aloe saponaria? Thus the specific epithet derived from the Latin sapo—or soap. So where do we start? Maybe with a little background about me. I’m a third generation kid from Big Sur, and I grew up on a ranch bordering the Los Padres National Forest. During our fifty years there, my family has encountered five forest fires. Yes, five. That’s one per decade. Some fires burned up brand new vehicles; others burned down just-finished buildings. The 1972 Molera fire made it to our ranch in half an hour, and my family barely had time to dive in the pool. With flames blowing over them, they nearly suffocated. And then, during the summer of 2008, I stood in the doorway of my tinder-wood house looking out at hundreds of feet of fire. It was an awesome sight, blowing up the far canyons with the ever-building sound of an avalanche. I heard trees falling like collapsing buildings, and as it came on, I suppressed panic and wondered, We’ll see if the aloe garden pays off. I’ll get back to the main reason I’m grateful for aloes, their fire-retardant power, but for now, let’s look at design. The usefulness of aloes in design stems from their versatility. Aloe vera is truly a beautiful plant: low-growing but upright, clustering, with a variable flower running yellow to orange, and aqua foliage that gets coppery in the sun. It’s perfect for some designs, but very limited in its scope. 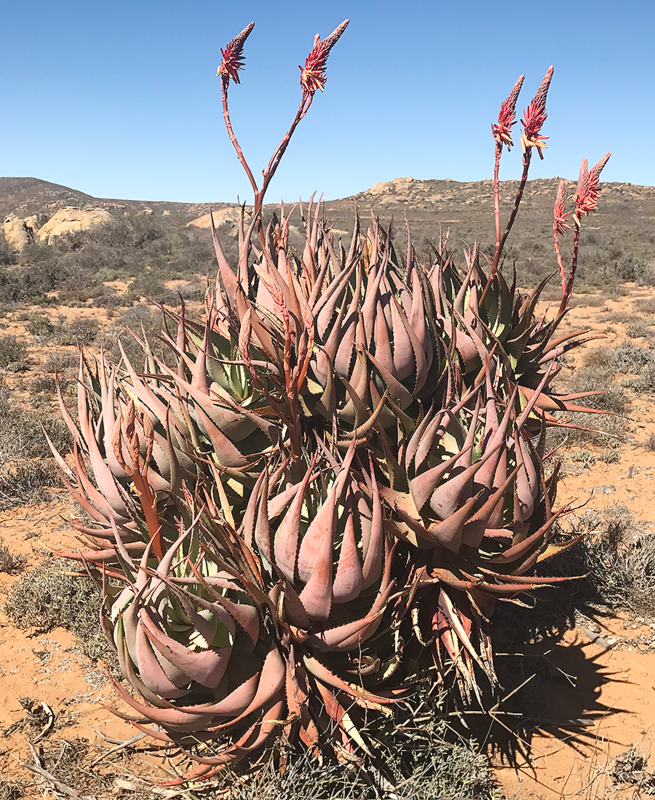 Luckily we have around 400 additional species, innumerable hybrids and even intergeneric crosses (a cross between two different genuses) such as Gasteraloe and Aloeloba! In fact, this abundance is another reason to love aloes. We self-proclaimed plant dorks can spend a lifetime collecting them (and I have!) without running out. The versatility within the genus allows us to fulfill nearly all aspects of a design. Here I’ll focus on stature, form, flowers, and color. Stature-wise, modest Aloe vera fits nicely into most designs, but what if it’s just a little too big? Aloe vera ‘Chinensis’ is a nice miniature vera. Of course even ‘Chinensis’ wouldn’t fit an alpine rock garden. But you could use juvenna, aristata, or the miniature Aloe haworthioides, which is lithophytic, meaning that it naturally grows in tiny rock cracks! Is a medium-sized “bush” aloe just the thing we need? Aloe ramosissima, A. tenuior, A. striatula, or A. arborescens will fill that niche. Conversely, what if a tree is called for, a really large element? There aren’t any aloe trees, are there? Yes, there are! Try large aloes like Aloe ferox, A. speciosa, A. pluridens, A. thraskii, A. dichotoma and A. vaombe, or absolutely huge aloes like A. barberae or A. ‘Hercules’. Form is an area where aloes really shine. There are clumping multi-headed aloes like Aloe vera, A. ‘Rooikappie’, A. nobilis, A. ‘Blue Dwarf’, A. brevifolia, or A. arborescens, or single-headed aloes such as Aloe gariepensis, A. peglerae, and A. vaombe. There are even aloes in-between like Aloe pluridens, which will be an upright tree form with only a few heads. Others send out suckers from underground, like Aloe variegata, and some with these suckers, like A. saponaria, will quickly populate an area with evenly spaced heads. Aloe forms tend to be rosette-shaped. By repeating this form, we can achieve continuity within a design, even while using many different species. So how do we soften these rosettes? Everyone loves grasses around rosette shapes... but there aren’t “grass aloes,” are there? Yes, there are even grass aloes! 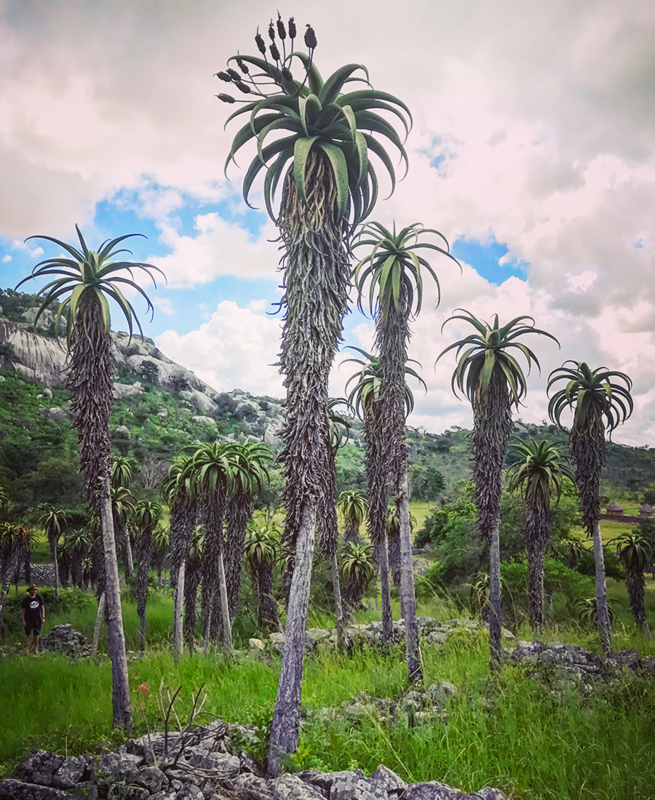 We can try one of many, such as Aloe myriacantha or A. bellatula; some can actually be mistaken for grass, as they grow in savannas. For a vigorous grass aloe, Johnson’s Hybrid can’t be beat. 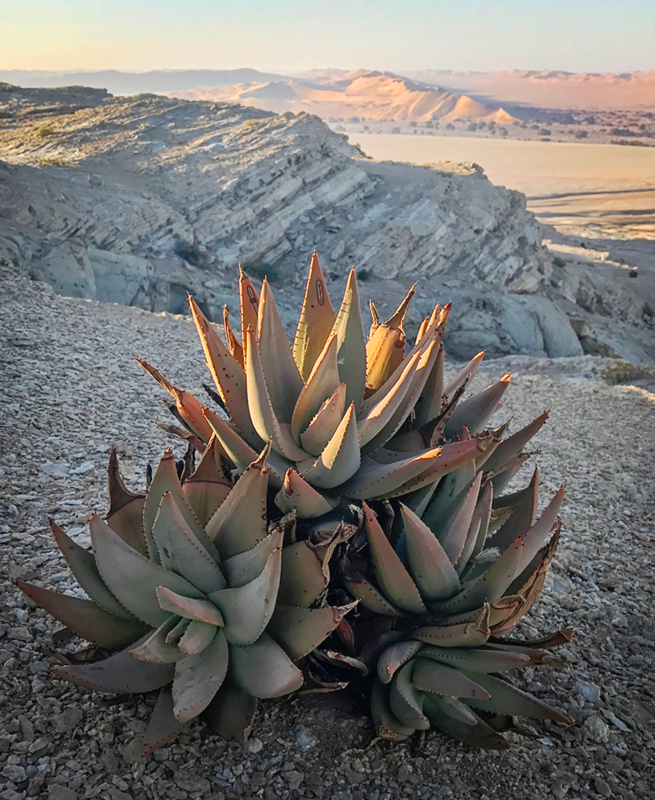 There are other unusual forms, like the ever-elusive spiral aloe (Aloe polyphylla), which, as the name suggests, creates a mesmerizing spiral, or Aloe plicatilis, with its unique fan-shaped heads. 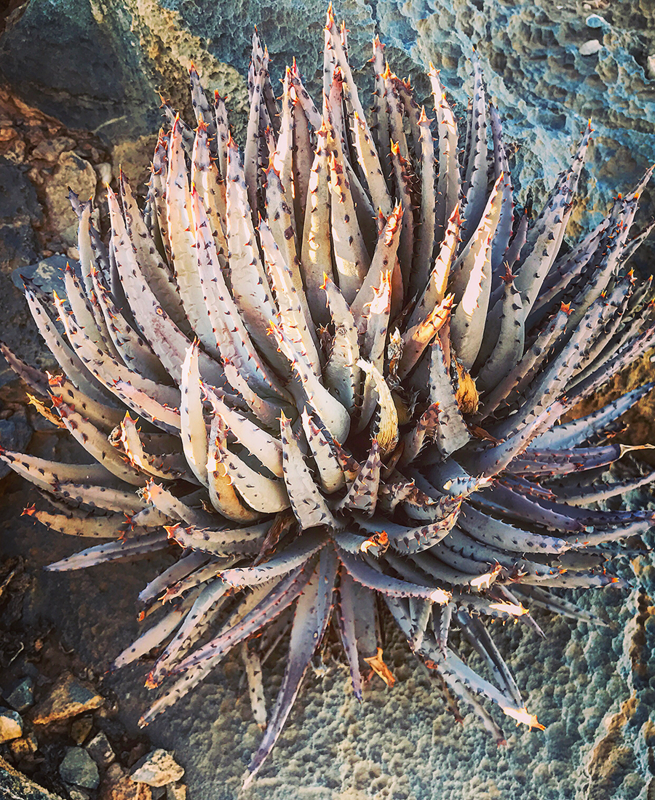 Snake aloes, which create an abundant mass of heads, can be a very useful form. My favorite snake aloes are Aloe distans, A. arenicola and A. ciliaris. Aloe ciliaris is exceptionally useful when grown up through a chain-link fence to make a living wall. Do you love flowers? Well aloes have got ‘em! And you know who else loves aloe flowers? Hummingbirds! Many aloes, such as Aloe ‘Tangerine’ or A. ‘Always Red’, are named for their beautiful blooms, which will often have striations of several colors at once. Aloes are happy to flower even when neglected, and depending on the species, they can flower at almost any time of year. I especially like Aloe arborescens, whose orange flowers brighten my garden during the darkest days of winter. But what if orange doesn’t fit our color scheme? Not to worry! Aloe blooms can be salmon or yellow, pink or white, rich royal red and even green! Some even have a metallic color, such as the bronze-y flowers of pluridens. The flowers themselves can vary in form and size as well, from the miniature haworthia-like flowers of Aloe haworthioides, to the medium pom-pom flowers of the spiral aloe and ‘Rooikappie’, to the massive candelabras of Aloe marlothii. Color is the most basic element in design, and aloes provide a wide spectrum. If we’re looking to put bright red on our palette, let's try Aloe gariepensis or A. vaombe, which not only has deep red leaves, but a massive display of red flowers during winter. When we need ice blue, Aloe brevifolia and A. ‘Blue Dwarf’ are there for us; when it’s time for bright orange, we can go for A. dorotheae. Many aloes are emerald green, including A. camperi, A. ‘Rooikappie’, A. nobilis, and A. barberae. Some are lime green, like Aloe pluridens or A. juvenna. There are even metallic aloes, such as Aloe ‘Walmsley’s Bronze’. Some aloes, like A. saponaria and A. maculata, take on a nice brownish-red hue. Many aloes are named for their wonderful hues, like Aloe striata, commonly known as coral aloe; Aloe rubroviolacea, with a botanical name that hints at its rich violet coloring; or A. ‘Bright Star’, a cultivar that’s ice blue with glowing pink margins. While aloes are a great candidate for shade gardens, most get their bright coloring from the sun, such as Aloe peglerae (which turns pink, so plan accordingly!). Aloe colors will fluctuate throughout the year, giving seasonal interest to your garden. Aloes do very well in containers, and this also makes most of them a good choice for indoors, where not all succulents can grow. Our friend Aloe vera is an excellent interior plant—after all, who doesn’t want some aloe vera on hand for that summer sunburn?—but others that work equally well are Aloe arborescens, A. ciliaris, A. juvenna, A. haworthioides, A. dorotheae, and A. barberae. Of note as well are cold-hardy aloes; if you've got a hard frost, Aloe marlothii is good to 20°F, and A. striatula is hardy to 15°F! Still not convinced about the many wonders of aloes? Then it’s time to finish my fire story. The fire closed in toward us. The gas tank of an old car parked near my cousin’s house detonated with a hollow blast, and I heard chunks of metal raining down afterwards. Honestly, I was practically hysterical by then, and that’s when the wave of fire crashed full force against us. Entire eight-foot stands of Aloe arborescens on the perimeter were vaporized, and pillars of ferox lit up in fiery columns. But then the surge waned, and like an army falling back, the fire blew off to the side, looking to flank the garden. It scorched the outer ring of bulbine, kalanchoe, cotyledon, senecio, and aloes, hopping into their beards and burning off years of dry leaves in quick bursts. In a few places, it reached deeper into the garden, catching here and there on some isolated watsonia or crocosmia patches. 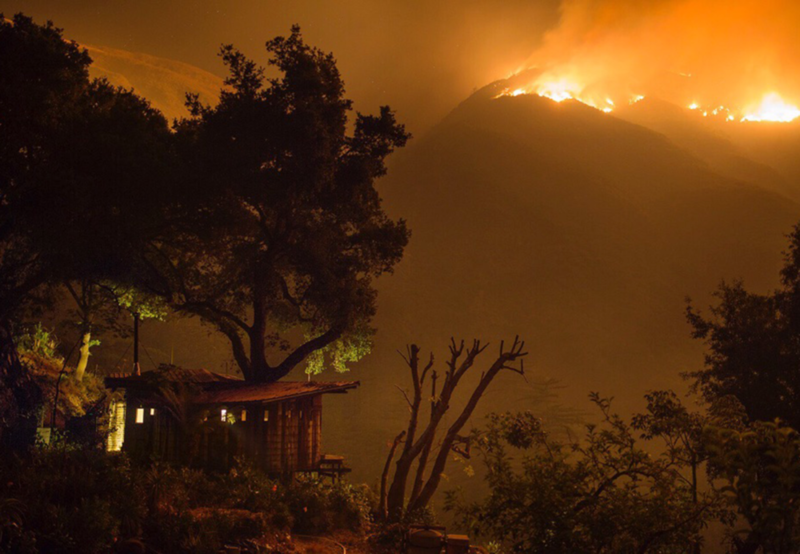 We stood there, hyper-alert with adrenaline, waiting to turn on our hoses, but the fire wrapped fully around the garden, beaten back by the succulent retardant, and then it stalled, leaving sputtering flames and blackened smouldering stumps. In the end, my experience of the Basin Complex Fire was, in all honesty, anticlimactic. I still held my hose, but I hadn’t even turned it on. My firefighter friend and I had a brief laugh at the absurdity of the aloe garden’s effectiveness, then we ran to help my neighbor, the one with the exploding propane tanks, who has since covered his entire hillside in aloes. Note: The Monterey County Weekly wrote about our defense of The Ranch. The article contains a lot of controversial information about backfires, but it helps to authenticate the above story. 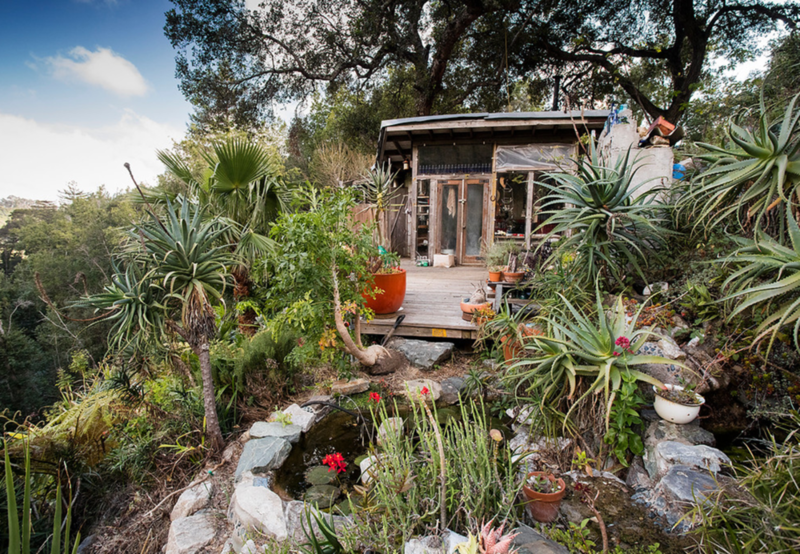 Tyson Curtis works at Flora Grubb Gardens, and also design gardens for Clients independent for Flora Grubb Gardens. You can learn about working with Tyson Here. We highly recommend Following Tyson and his travels and adventures on Instagram.